The GX460 incorporates steering-wheel-mounted control switches and voice control let you keep both hands on the wheel. Powerful high beam halogen headlamps contribute to excellent visibility without causing glare to oncoming traffic, while advanced LED headlamps are used for the low beam. The GX460 supports your natural driving skills with advanced braking and traction technologies: Multi-terrain ABS (Anti-lock Brake System) with EBD (Electronic Brake force Distribution) helps to optimize the brake force applied to each wheel. In addition, TRC (Traction Control System) adjusts the amount of power that is applied to the wheels to help reduce wheel spin, while VSC (Vehicle Stability Control) helps to prevent loss of control in extreme situations. When the pre-crash safety system (Millimetre-wave radar type) determines that there is a likelihood of a collision with a vehicle in the road ahead, it alerts the driver with a display and a buzzer, and the pre-crash brake assist operates to increase the braking force when the driver depresses the brake pedal. When it determines that it is difficult to avoid a collision, the pre-crash brakes operate to help reduce the collision speed even if the driver does not apply the brakes. At the same time, the pre-crash seatbelts rewind the front seatbelts before a collision to help reduce injury due to the collision. 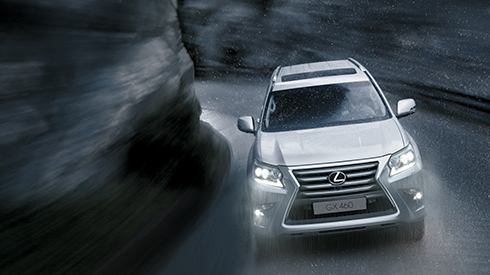 The GX460 has been engineered to achieve class-leading safety performance. High tensile steel has been used throughout to produce a stiff structure that is very effective at absorbing energy in a collision. The GX460 also features ten SRS airbags as standard, including front seat SRS knee airbags and SRS side airbags in the outboard second row seats. The driver’s and front passenger’s seats also feature WIL (Whiplash Injury Lessening) concept and Active Headrest, to help minimize the risk of neck injuries in low speed rear-end collisions.